Robot Projects, and Videos, and Pictures, and Discussions Oh My! Do you have a cool robot project you are working on? Have you posted it in the TRC projects gallery yet to share it with others? No? That is very selfish of you. Everyone loves to see cool projects. So come check out what others have posted and add your own. There are also Community Videos, photos, and of course our active forums. 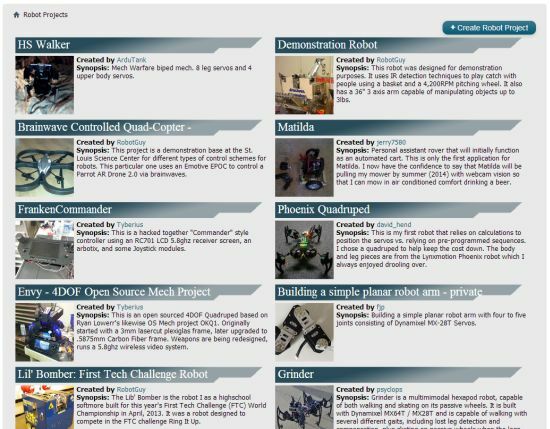 The Mech Warefare forums are always buzzing because people like building robots that shoot each other. If you haven’t visited yet, come say hello! This entry was posted on Wednesday, January 15th, 2014 at 7:59 am	and is filed under Announcements. You can follow any responses to this entry through the RSS 2.0 feed. You can leave a response, or trackback from your own site.